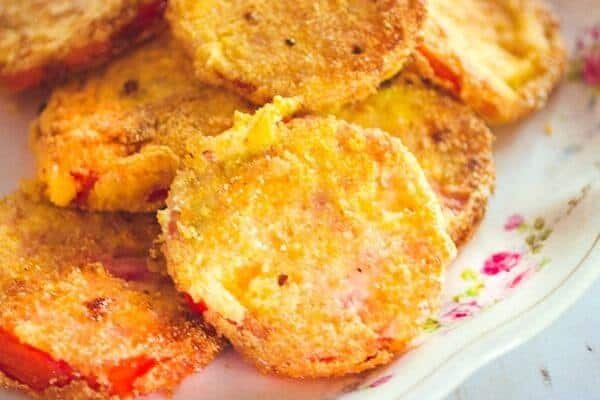 This fried green tomatoes recipe is one of those iconic southern dishes that you have to try at least once. They’re hard to find commercially but luckily this classic side dish is much easier to make than you might think. 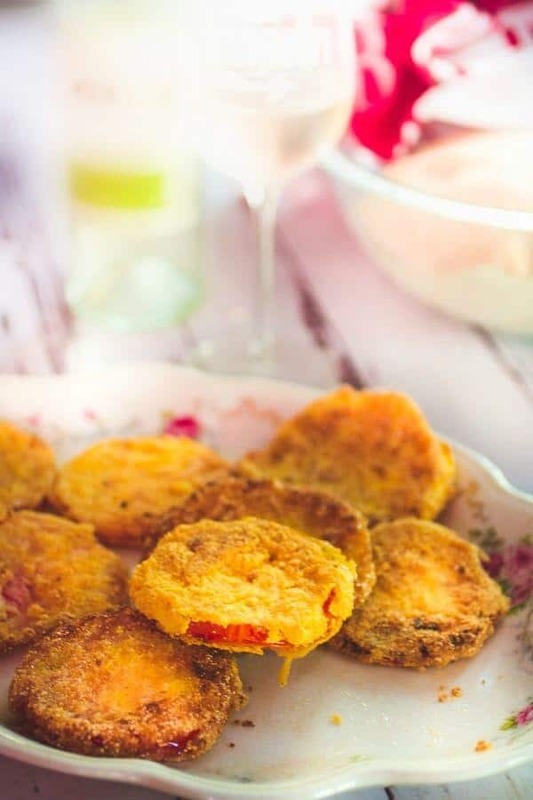 Green tomatoes, coated with a combination of cornmeal and breadcrumbs and then fried, end up tender and juicy in the middle and delicately crispy on the outside. You can also fry up red tomatoes but be sure they are not over ripe or they will be too mushy. So you may have noticed that my fried green tomatoes have a distinctly red cast to them. That’s because I forgot about them on the counter and they went ahead and started to ripen. I’m not one to waste food if I can help it so I went ahead and used them anyway. 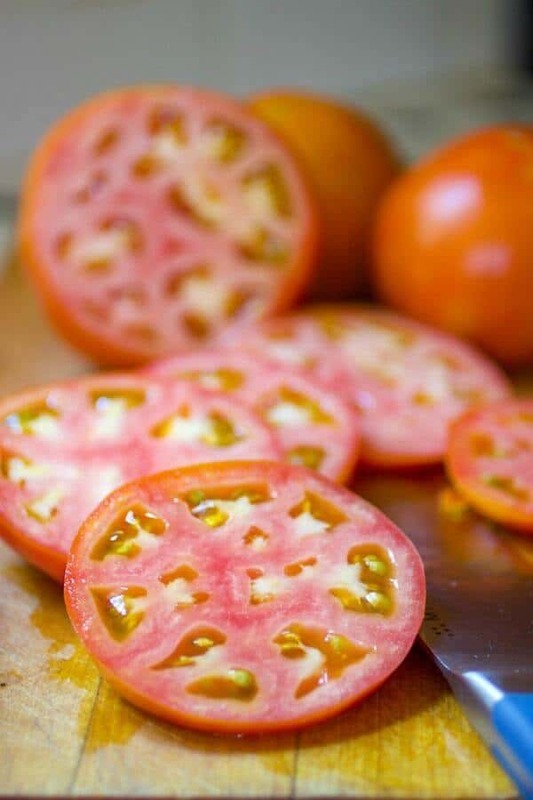 Don’t worry if your tomatoes are a little pink – as long as they aren’t completely ripe you’re good to go. They need to be firm and not juicy or you’ll end up with a soggy crust. This is a really easy recipe to make. Just follow each step carefully. Written steps are beneath to step by step images. Follow these steps for perfect fried green tomatoes! Slice tomatoes about 1/4-inch thick. Put flour mixture in one bowl, buttermilk mixture in one bowl, and crumbs in one bowl. Dip the tomatoes in the flour. Now dip it in the buttermilk mixture. Finally dip it in the crumb mixture. Green tomatoes mean unripe tomatoes – if they’ve become a little red it’s fine as long as they are still very firm and not quite ripe. This recipe is pretty easy. Follow these tips for perfect fried green tomatoes every time. Cut them about 1/4 -inch thick with a sharp knife. Use a light, high smoke point oil like peanut oil (unless there are allergies). Make sure the oil is at about 360 degrees before you add the tomato slices. Heat the oil back to 360F between each batch. 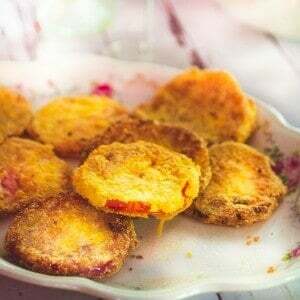 Gently slip the fried green tomato slices onto a thick layer of paper towel to drain. Don’t stack them or they’ll get soggy. Serve them while they’re hot. Are green tomatoes and tomatillos the same thing? Nope. Green tomatoes are unripe tomatoes. They can be any variety of tomato from Big Boy to an obscure heirloom variety. Tomatillos, on the other hand, are the fruit of a related but different plant and are covered with paper-like husks. They don’t turn red ever. Funny you should ask. All tomatoes, which are related to the nightshade family, produce tomatine, a chemical that’s toxic in large doses. The leaves have the most and fully ripe tomatoes have the least but you’d have to eat bushels of them at once before you’d get sick. How to Keep Fried Green Tomatoes Warm? If you’re making fried green tomatoes for a crowd you can keep them warm in a 250F oven. It’s best to keep them on a wire rack over a cookie sheet. If you don’t have a wire rack you can put them on the cookie sheet but they may get soggy on the bottoms. One of the most important things to have, as far as I’m concerned, is a couple of cast iron pans. Lodge is my favorite brand – they last forever. This fried green tomato recipe takes just 20 minutes or so to make. More Southern Recipes on Restless Chipotle. Grilled Shrimp Creole with Roasted Tomatoes – Grilled Gulf Shrimp with an amazing roasted tomato and pepper sauce – it’s so easy. Southern Corn Pudding – classic corn casserole that works so well with roasted meat. Southern Buttermilk Biscuits – There’s nothing like fluffy buttermilk biscuits. 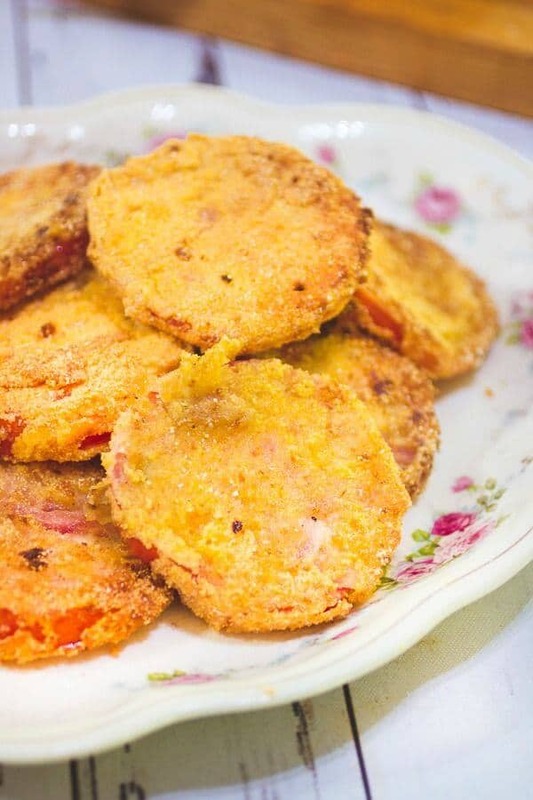 Keep fried green tomatoes crispy in a 250 degree oven. Alabama Slammer – Perfect paired with a front porch and a good book. Pig Pickin Cake – Yellow cake with pineapple and mandarin orange topped with a creamy whipped topping. Blackberry Cobbler – Big, plump blackberries under a sugary, buttery crust – old fashioned goodness! Chocolate Chess Pie – This pie is like nothing you’ve had – chocolatey, fudgy, and so easy. 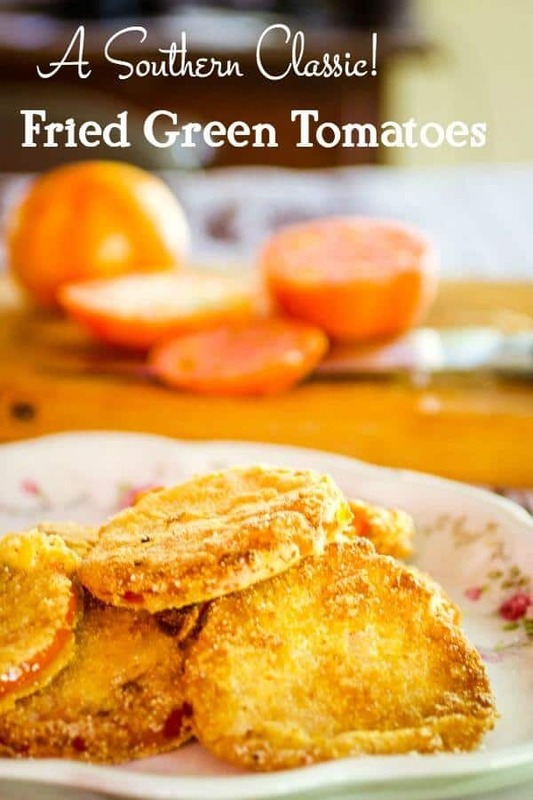 If you’ve never tried a fried green tomatoes recipe you are in for a real treat. Serve these on top of burgers, as a side dish, or as an appetizer with a homemade remoulade sauce. If you love this recipe please give it 5 stars. Classic southern side dish that's so good with almost everything! Make sure the tomatoes haven't become fully ripe. Put the flour and seasoning in bowl. Add the buttermilk and eggs to another bowl. Add the breadcrumbs and cornmeal to a third bowl and mix well. 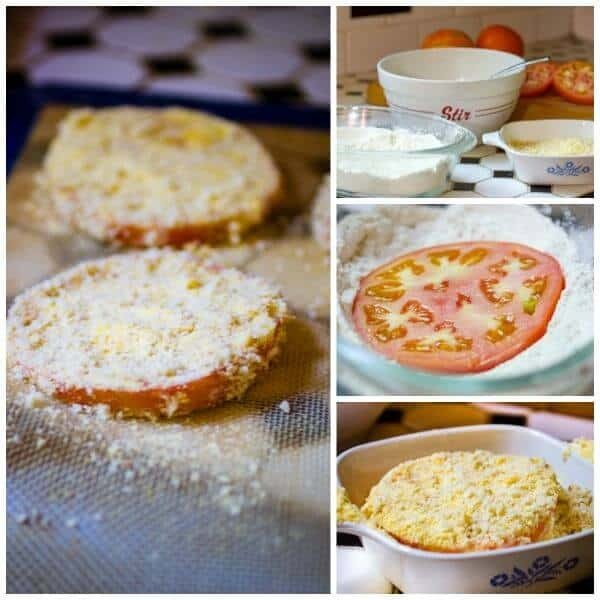 Dip the tomatoes in the flour mixture, then the buttermilk mixture, then the breadcrumbs to coat. Add 1/4-inch of oil to a heavy skillet and heat until the oil sizzles, about 360F. Carefully add the tomato slices and fry until golden on one side. Remove from the oil and drain on absorbent paper towel. Add oil to pan as needed and let it return to 360F. Serve immediately with the remoulade. Nutrition information does not include remoulade. Let me know how he likes them, Alix!